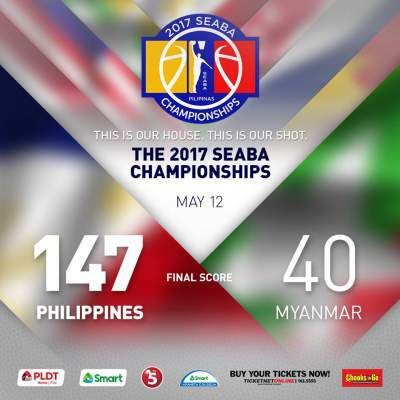 Gilas Pilipinas romp past Myanmar 147-40 in SEABA opener - Balita Boss! Calvin Abueva had 22 points as the Gilas Pilipinas opened its 2017 SEABA Championship campaign with a 147-40 romp over Myanmar on Friday night, May 12. The Philippine men's national basketball team scored the first 17 points of the game and closed the first quarter with a 25-point lead, 32-7. At the half, the lead was 54, at 66-12. Abueva also had six rebounds, four assists and five steals to earn the best player of the game honor. Allein Maliksi added 20 points, and Gilas rookie Jio Jalalon contributed 13 points, six rebounds and 10 assists. Gilas dominated the game with 45 assists, 25 steals, 12 blocks and shot 64 percent from the field. Wana Aung led Myanmar with 12 points. Check the full game stats here: http://www.fiba.com/ls/#13235&13261-A-3. The Gilas Pilipinas next opponent will be Singapore on Saturday, May 13 at 7 pm.